Direct access to rail-served land in Texas can give businesses a significant boost when it comes to shipping or receiving goods. However, securing that rail service in the Delaware Basin region of Texas often proves to be a daunting and expensive undertaking for those who go after it without assistance from expert real estate operations. The First Keystone Industrial Park, overseen by First Keystone Property Group, is unique in that it offers quick-and-ready access to land with rail service in Pecos, Texas. Rail-served land in Reeves and Ward Counties is scarce (except for those willing to run the gauntlet with UP).We are located on the Pecos Valley Southern Railway, which directly connects to the main line of the Union Pacific. This is one of the key factors that makes our rail-served land in Pecos so desirable -- First Keystone is your #1 option! The closer to rail-served land in Texas, the better. Since we are conveniently located at exit 39 off I-20, excellent key highway links are assured. By configuring lots that leverage rail service, it’s easier than ever to achieve intermodal transportation objectives. Our rail engineering firm is Central State Resources – the most trusted name in rail design and construction in this Delaware Basin region where rail-serviced land for development is in very limited supply. Our planned rail siding is expandable and its location could be shifted to meet your exact specs. We can deliver thousands of feet and help you break ground sooner than ever expected. Our initially planned siding has been engineered and can be built within 10 weeks. This is part of our promise to customers whose needs would rarely be met it if it weren’t for a company like First Keystone delivering solutions to companies with special transportation requirements. Act now to ensure your access to this prime rail served land in the Pecos region. As experts on industrial property that gives companies the edge over competitors, First Keystone can help you establish the facility that achieves all your requirements. 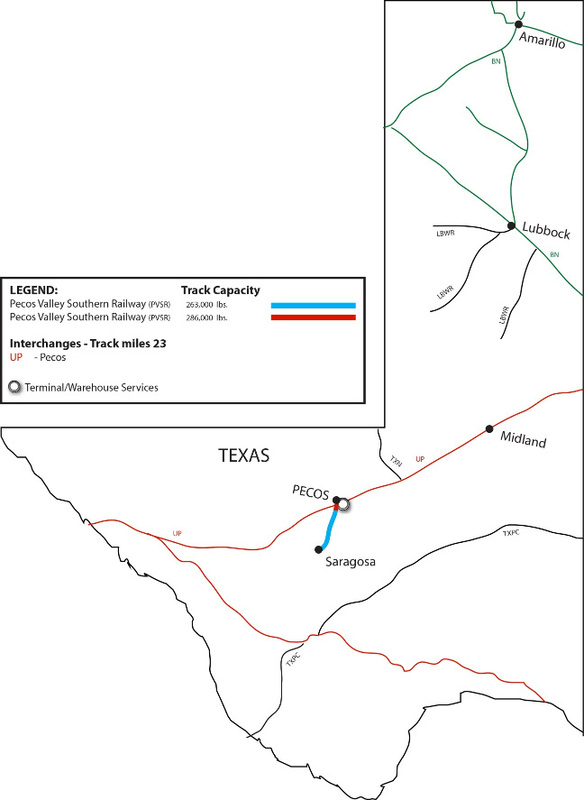 Pecos Valley Southern Railway serves industrial users in the Delaware Basin at Pecos.